Kids Eat Free at Coal Grill and Bar Valid with child 10 and under! 30% Off Food Bill with Cinema Ticket at Coal Grill and Bar Must be valid cinema ticket for each day! 25% Student Discount at Coal Grill and Bar With valid student ID! Coal Grill and Bar was founded in 2007, and since then has gone from strength to strength, providing a mouth-watering choice of flame-grilled, snoked and barbeque dishes. The idea behind the Coal Grill and Bar brand was to provide the best in steaks from high-quality British farmers at a reasonable price, without too long a wait. The menus at Coal Grill and Bar restaurants are no longer just about beef, however, and have some fantastic chicken, seafood and pork options, as well as some American and Mexican classics. Coal Grill and Bar serves both lunch and dinner, and you can also go there just for their fantastic cocktails. You can save on your bill when you look out for deals here at vouchercloud in the form of our eating out discount codes. These can be used to get you the best prices when you head to your local Coal Grill and Bar for a meal or drinks (excluding December). Coal Grill and Bar has a full kids' menu too, so can be an excellent place for a family lunch or birthday party. How do I use my Coal Grill and Bar voucher? Not all of our Coal Grill and Bar deals require you to have a voucher – you'll see the details on how to get other kinds of discounts when you click 'View Deal'. Join the Coal Grill and Bar club for monthly special offers and a discount off your first meal there after signing up. This is one of the best loyalty schemes of any UK restaurant chain, so is well worth subscribing to if you love eating out and want the best deals! Is there a Coal restaurant near me? You can find the locations of all of the Coal Grill and Bar restaurants listed on their homepage. Select your closest to find out the menu and opening times for your chosen branch. Is Coal Grill and Bar food suitable for vegetarians? Coal Grill and Bar is very much a barbeque oriented restaurant, and so most main courses do include meat, poultry, fish or seafood. There are vegetarian options in the starters and side dishes and these are clearly marked on the menu. Those who don't eat meat but eat fish will find plenty of choice, however. Can I book a table at Coal online? You can book online at any of the Coal Grill and Bar restaurants by choosing the one you want from the homepage and clicking on 'Book A Table'. Every Coal venue has its own contact information - you can find every email address and contact number at the base of the homepage. For finger-licking barbeque food, steaks and burgers - Coal Bar and Grill is just the dining experience you're after. They use the best quality meat from local farms in grill dishes that don't break the bank - all with great sides and delicious drinks served up alongside. Dine out with our Coal vouchers, and you'll make a tasty saving on your bill total! From a night out with friends to a family lunch - Coal Bar and Grill has flame-grilled dishes and a lively atmosphere you'll come back again for! Coal Grill and Bar menu varies in accordance with the restaurant's location in consideration of the local produce available nearby. The barbeque selection is accompanied by an amazing choice of steak as well as pulled pork, burgers, schnitzel, chicken and fish dishes. Book your table to take advantage of our latest offers, or if you're a student, flash your ID card to claim student discount at your local Coal restaurant. Coal Grill and Bar is famous for its speciality 'Firesticks'. These are meat skewers served on hot skillets at your table, with peppers and other vegetables. Aside from the popular choice of steak, you can choose from other tantalising meat options including gammon, pork tenderloin, chorizo and chicken thigh. Look out for specific offers or a Coal Bar and Grill discount code on vouchercloud, and cut the total cost of your bill by up to half. 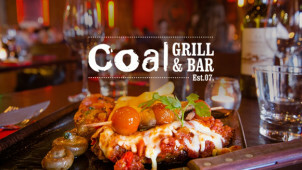 If it is your first time at a Coal Grill and Bar restaurant - these are well worth a try!